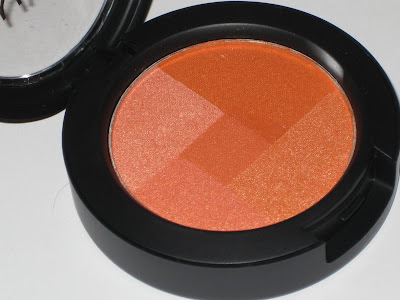 Yay for the Muse jumping back on board the Beauty on a Budget bandwagon! 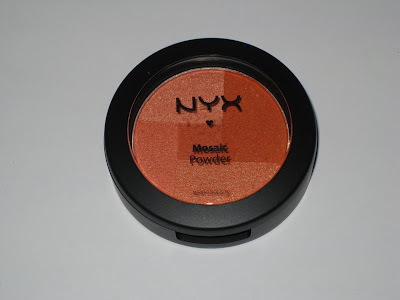 This time I’m raving about NYX (kinda, sorta, maybe!). Since it’s Summer it appears that NYX is busy pimping some of their older line up. Which basically means they have cute little pop up displays all over the place that have separate collections of makeup they are whorin’ out to the masses. I’ve run across two displays like this so far. One was the glitter eyeliners and the second was the Mosiac Powders. Both items are old news and nothing really new about ’em but NYX just revamped the display I guess to catch new buyer eyes. They caught my eye recently when I was at Harmon’s drugstore picking some items up for my lovely friend Aya at Irodori. These particular blush powders from NYX looked outstanding so I thought I might as well grab ’em while the grabbing was good. They only cost $5.99 USD so really I couldn’t go bankrupt buying these. Many months ago NYX had contacted me with a discount to do a review on their products and honestly I never got around to actually purchasing anything or doing the review for that matter! Damn the Muse to hell for not getting around to doing these important things! The powders are gorgeous. The packaging is simple yet elegant and quite reminds me of MAC. Why I never purchased NYX prior to this can only be blamed on my snotty nature when it comes to cosmetics. I purchased two colors but there are quite a few color selections available that range from lighter to darker. I got the Pinkish Red and the Orange color. I don’t particularly love either one sadly. The pink goes on way to red and the orange makes my face look very dull. The powder formula is good. Silky, blends well, and lasts long however I think the color combinations are just not working well for me. I’m normally a very big fan of vibrant shades but neither color seems to suit me. The orange color seems way too orange! And the pink color seems to just not pick up enough of the lighter shades in the palette and it grabs up more of the red which causes me to look like a clown! Ugh! Awwww moan! I really wanted to love these! 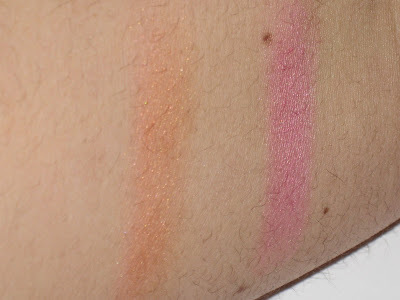 I’m going to keep trying with the pink powder but the orange after swatching is a big no! I think the main problem with these is that fact that they contain five separate shades of color which could be a little too much. I guess it’s a form of graduation but it just doesn’t work so well. When I applied the pink the color went on splotchy and my brush was picking up more of the vibrant red and not mixing correctly with the lighter shades in the powder. 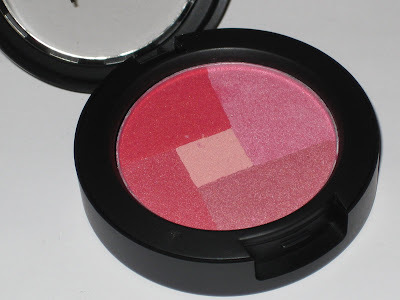 I can’t give these too poor a rating simply because they are very pigmented blushes and good quality! However, I just didn’t like them and they didn’t work well for me. Yes, they are nicely pigmented. Yes, the price is more than alright. But they don’t exactly do what I want them too! 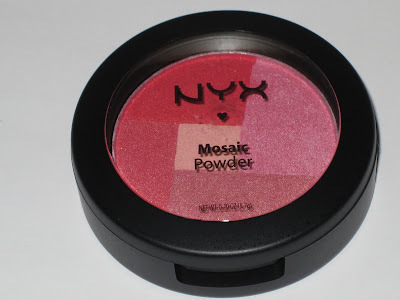 NYX Mosaic Powders get a big thumbs down from the Muse! Eh, these have the same pigmentation,texture and consistency issues as Benefit’s Dandelion and Thrrrob powders, so I’m not too crazy about them. 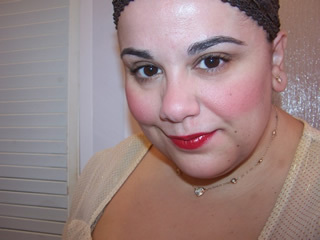 NYX’s cream rouges are much better, on par with MAC’s (if not better), though they veer warm in color. Forget NYX; if you live near a RiteAid, try to get ahold of ‘Jesse’s Girl’. The loose mineral eyeshadows are supposed to be on par with mainstream mineral brands, and the new psycadelic LE compacts are to die for! 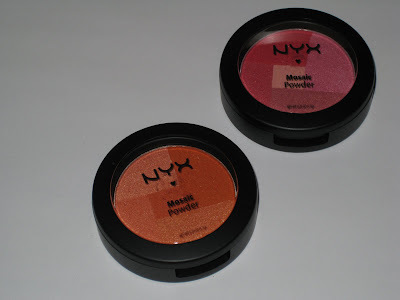 I’ve never tried these, but I do love the NYX eyeshadows. They’re very pigmented though, so it took me some getting used to, since I tend to make my makeup look more natural. Mmm I got decent pigmentation from these but the color blended like crap! LOL I’m good at killing lemmings and creating them! Go me! Takes some getting used too! Oh! Looking forward to your review. Might I ask the price? I’m guessing double! Curious minds. I use #07 Cafe almost everyday! It’s my favorite! I only use it as eyeshadow. I use the lighter shades as highlighter, and the darker colors to add some shadowing. It’s a great everyday neutral look! I wouldn’t want to use them as blush because I’m kind of scared to not get the right combination of colors on the brush. As eyeshadow, you have a little more control over what is going where.